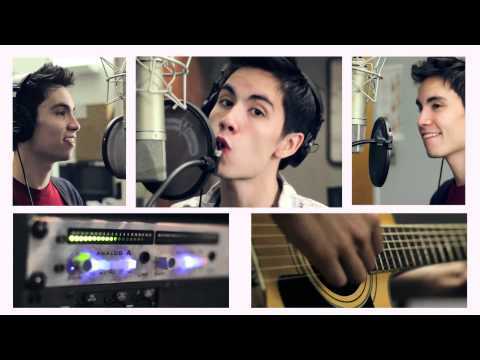 Sam Tsui sings a mashup up of some of the top songs right now including Love The Way You Lie, Dynamite, and Teenage Dream. Like he did with Summer Pop Medley and Nothing On You Soul Sister mashup, he hits all the notes in this latest mashup. The visuals for this video is stepped up. You can download this song FREE here. BTW – Be sure to watch Sam Tsui’s first original song Don’t Want an Ending. This entry was posted in music on September 12, 2010 by Kevin Hsieh - channel APA. love those song…they are so nice.. This guy has mad singing skills if that was him really singing.But I give u props good job. Sam is talented musician & singer who has super skills to hit all the high notes with clarity. Watching his videos from 2008 till present, I’m extremely gratified to see material improvement in every aspects of his artistry. He definitely would see more promience & success if he empolys a professional manager to seek all opportunities especially recording contracts, multiple appearances in the entertainment events, along with his own self management in his presentation as well as in variety of attires, black & yellow appear to be his colours of appeal. I can’t wait to see his huge success soon.